This entry was posted on May 11, 2013 by admin. Marijuana might be illegal, but more than a dozen US states now allow the medicinal use of cannabis. Of course, this is controversial, because medical pot still makes people high. But what if the psychoactive ingredient in marijuana, the chemical known as THC, could be removed? That is exactly what an Israeli company says it has managed to do. It was an Israeli scientist who first isolated tetrahydrocannabinol – or THC – back in 1964. Now, an Israeli company claims to be the first to develop a strain of the cannabis plant that contains almost no THC at all. The company is called “Tikkun Olam,” which means “healing the world” in Hebrew. It grows cannabis in Israel and runs the only legal storefront dispensary in the country. enter. There is no smoking going on inside. But the unmistakable smell of cured marijuana wafts out onto the sidewalk as customers come and go. Medical marijuana has been legal in Israel for more than 10 years, though the use of cannabis did not take off until 2009. It is tightly controlled by the government, largely through the ministry of health. About 9-thousand Israelis have a license to buy the stuff. 60 year-old Avi – a cancer survivor – is one of them. The pot might not have cured his cancer, but Avi tells me smoking it helped him get through the chemo treatments. And he is still smoking daily. A few weeks ago, Avi said he started using the new strain called “CBD.” It has almost no THC, which means smoking or ingesting it does not bring on the same intoxicating effects as most types of cannabis. That is, it helps him stay alert, so he can work or drive or engage in daily activities in a normal way, he said. 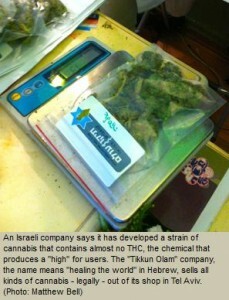 The new cannabis strain took about 3 years to develop through cross-breeding, according to Zach Klein of Tikkun Olam. There was no genetic engineering involved, he said. The new strain is all natural. “Avidekel” is the nickname for the CBD strain, Klein said. It has only been available for a few weeks. So far, he said there are only about 10 regular users. But it is showing some promising results. At Tikkun Olam’s cannabis clinic in Tel Aviv, where staff help new patients learn about using medical marijuana, Maayan Weisberg told me that CBD is already helping people who suffer from infections or nausea, but do not want to smoke to get high. But Weisberg is quick to point out that this new and more benign strain of cannabis will simply not cut it for all medical marijuana users. That is just how one longtime cannabis advocate told me he feels. Standing outside the cannabis dispensary with a plastic shopping bag full of cannabis, David Harari said that medical marijuana has long helped him cope with the effects of Parkinson’s Disease, like the uncontrollable shaking. When the shaking starts, Harari said smoking as little as half of a cannabis cigarette makes it stop right away. Harari said he does not have much interest in trying the new cannabis strain. Klein told me his company is getting inquiries from growers abroad, including in the United States. But international collaboration would be tough, because with or without THC, marijuana is still a controlled substance.